The Nationals' needs would seem to argue against trading Tyler Moore. The players who get traded at this time of year generally are not pricey superstars such as Phillies left-hander Cole Hamels. No, the players who get traded usually are those who are out of options, fighting for one of the final spots on a roster. 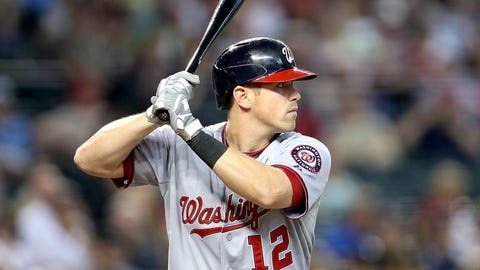 Players such as Nationals first baseman/outfielder Tyler Moore. The Giants are among the teams scouting Moore, as first reported by MLB Network’s Peter Gammons. Virtually every team is weighing out-of-options candidates as upgrades, and not necessarily focusing on one target. Moore, 28, would seem unlikely to be traded, considering that Nationals outfielders Jayson Werth (shoulder), Nate McLouth (shoulder) and Denard Span (abdomen) all could start the season on the disabled list. The Nationals, however, would trade Moore if a deal made sense, according to major-league sources. They obviously would not give Moore away — they view him as an average to above-average major leaguer based on his minor-league numbers and projections, sources said. They also know that Moore represents insurance for first baseman Ryan Zimmerman, who appeared in only 61 games last season due to thumb and hamstring injuries. Still, Nationals general manager Mike Rizzo is always open to making a deal. Rizzo is very precise with his requests during trade negotiations, rival executives say. If the Giants or another team offer the right deal for Moore, great. If not, Rizzo simply will move on. The Giants clearly need help — right fielder Hunter Pence is expected to be out until at least May 1 with a non-displaced fracture in his left arm, and manager Bruce Bochy told reporters that center fielder Angel Pagan received two injections in his surgically repaired back on Friday. Bochy did not rule out using first baseman Brandon Belt, first baseman/third baseman Adam Duvall and infielder Matt Duffy in the outfield, but in a perfect world the Giants would increase their depth. The Padres, Red Sox, Dodgers, Rays and Diamondbacks all are carrying a surplus of outfielders. But given that the Giants’ needs might only be temporary, an out-of-options type might make more sense. And Moore is but one of many such players who is available.